Voted the best film in the history of Polish cinema in the monthly Polish magazine FILM, Wajda’s Oscar-nominated epic Promised Land is a wry, incisive, shocking and elegantly realised Dickensian tale of greed, human cruelty, exploitation and betrayal. Zanussi’s philosophical/scientific exploration of man’s place in the world. Illumination serves as an idiosyncratic, engaging, and insightful fusion of science and art, precision and creativity, intellect and emotion. Marczewski’s engaging anti-communist satire (with shades of Keaton’s Sherlock, Jr. and Woody Allen’s The Purple Rose of Cairo) is a darkly comic, complex, allusive and deeply-felt examination of the nature and effects of censorship, directed by one of Poland’s leading intellectual – and much censored – filmmakers. 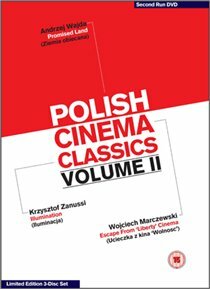 All three films are presented in new HD digital transfers with restored picture and sound, approved by the filmmakers, and will feature newly filmed, exclusive interviews with directors Andrzej Wajda, Wojciech Marczewski and Krzysztof Zanussi.